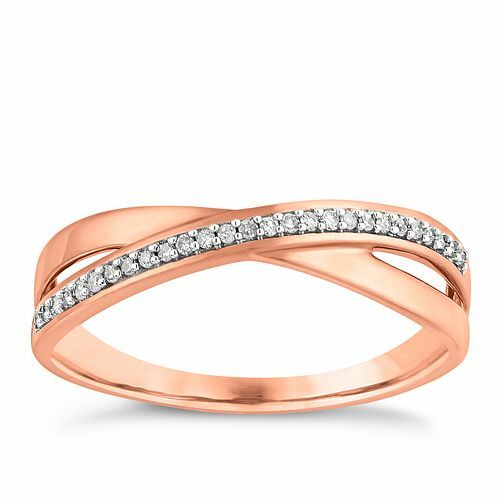 Crafted in luxurious 9ct rose gold and set with sparkling diamonds, this distinctive ring features a beautiful crossover design that's made to stand out. Coordinate with other rose gold jewellery for a polished finish, or contrast with bright jewel tones for a contemporary feel. 9ct rose gold diamond ring is rated 5.0 out of 5 by 1. Rated 5 out of 5 by Anonymous from Beautiful I love this ring. It stacks lovely with my engagement ring so there is no space gaping between them. Fantastic quality and sparkles beautifully.